This is a recipe I’ve been trying to get my hands on for years. 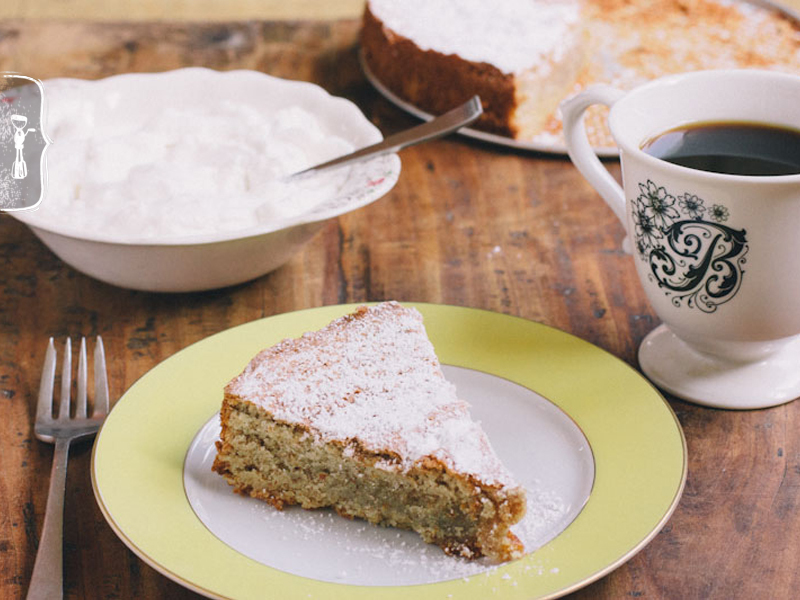 Ever since walking the last 100 miles of the El Camino de Santiago, a pilgrimage of Northern Spain, and tasting this regional cake, I’ve been on a hunt for the traditional Tarta de Santiago Recipe. I tested several versions at home and finally found the perfect one on epicurious.com by Claudia Roden. 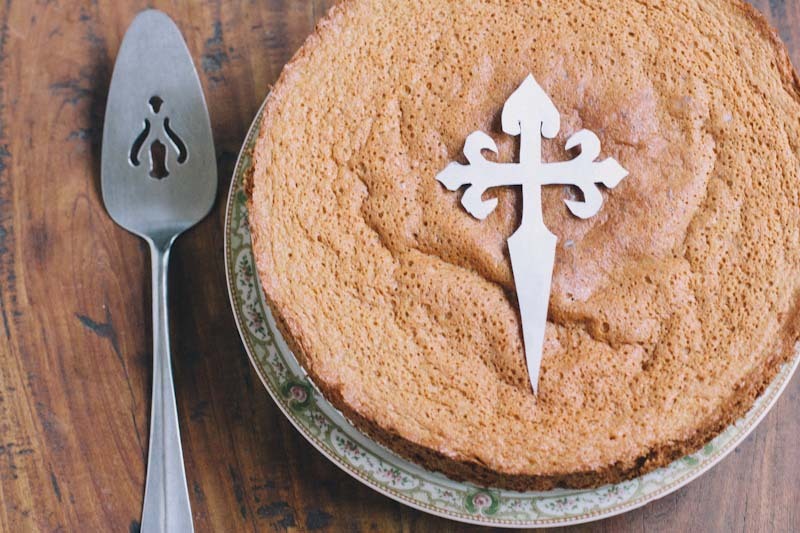 This special almond cake, which also happens to be a gluten free cake, is made in cities across Northern Spain and enjoyed by the locals as well as those taking the journey to Santiago, the city where Saint James’ body lay. Back in my college days, I had the chance to walk the last 100 miles (about 7 days) of this pilgrimage also known as The Camino de Santiago (translated the way of Saint James). Legend holds that St. James’s remains were carried by boat from Jerusalem to northern Spain where he was buried on the site of what is now the city of Santiago de Compostela. Folks from all over the world take this trek in search of more spiritual answers in their own life or just as a time of travel and exercise. Many consider the experience a spiritual adventure to remove themselves from the bustle of modern life. It serves as a retreat for many modern “pilgrims”. The starting point for this pilgrimage is different for many. Today tens of thousands of travelers set out each year from their front doorstep, or popular starting points across Europe, to make their way to Santiago de Compostela. We started about 7 days out and ventured through modern as well as medieval cities, some days feeling as if we had literally traveled back in time. Along the way, we camped at different sites and found places to eat, from small cafes to local’s homes. Every city or town that we walked through had cafes with one item in common, the Tarta de Santiago. This cake is made from almonds, lemon and orange zest and a few other ingredients. It’s simplicity and rustic nature remind be of the simplicity of many of the towns we journeyed through. 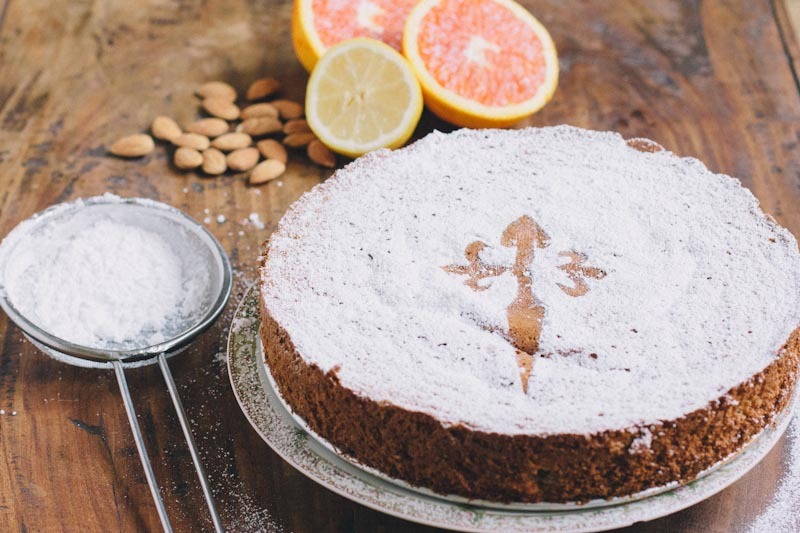 The cross on top of the cake is a symbol of Saint James, and is appropriately stenciled on the top of every cake in the region. Now that I’ve found my prized recipe I am sure I’ll be making it for years to come and remembering my special time in Spain. 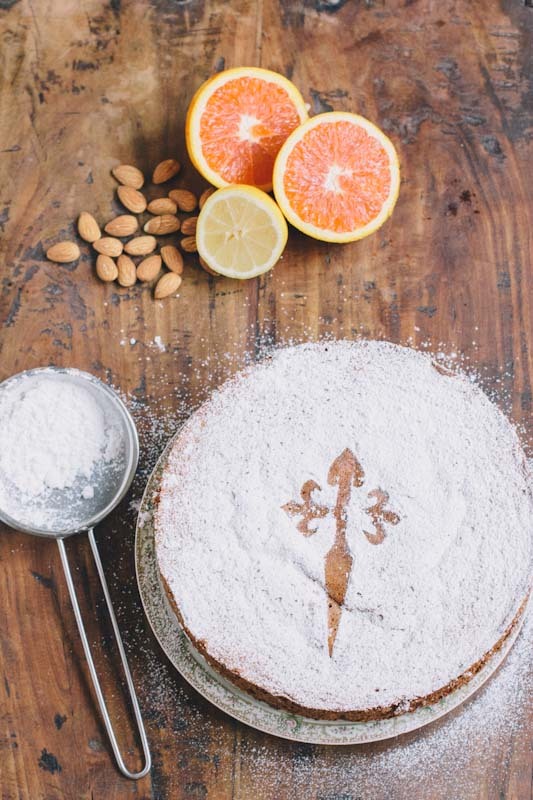 An authentic recipe for the Spanish Almond Cake found on the Camino de Santiago. Finely grind the almonds in a food processor. With an electric mixer, beat the egg yolks with the sugar to a smooth pale cream. Beat in the zests and almond extract. Add the ground almonds and mix very well. With clean beaters, beat the egg whites in a large bowl until stiff peaks form. Fold them into the egg and almond mixture (the mixture is thick, so you will need to fold it quite a bit). Grease an 11-inch springform pan, preferably nonstick, with butter and dust it with flour or spray with cooking spray. Pour in the cake batter, and bake into a preheated 350°F for 40 minutes, or until it feels firm to the touch. Let cool before turning out. Just before serving, dust the top of the cake with confectioners' sugar. Or, if you like, cut a St. James cross out of paper. Place it in the middle of the cake, and dust the cake with confectioners' sugar, then remove the paper. Stencil the top of the cake using the traditional cross symbol of Saint James. To get the stencil of the cake go to He Needs Food. 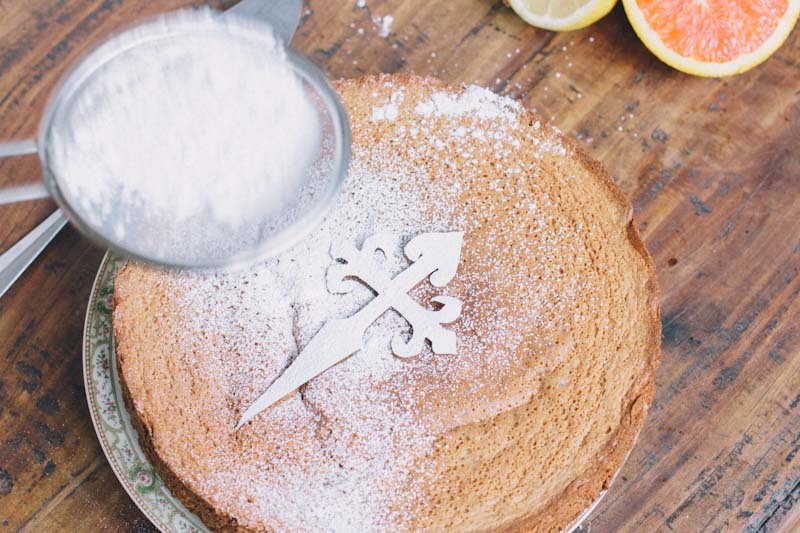 Cut out the cross then use it as a stencil as you sprinkle the cake with powdered sugar. Be my this looks beautiful and I love your decoration on the cake, thanks for sharing! Happy Easter and what a great adventure you had. Really, once-in-a-lifetime type things. Thank you for sharing this cake recipe. It sounds delicious! I have always wanted to try an almond cake like this, but I’ve never come across one with such a great story behind it! Thank you for sharing your memories of The Camino de Santiago, sounds like an incredible experience. Kate, I think you’ll really enjoy the cake! Let me know if you try it out! 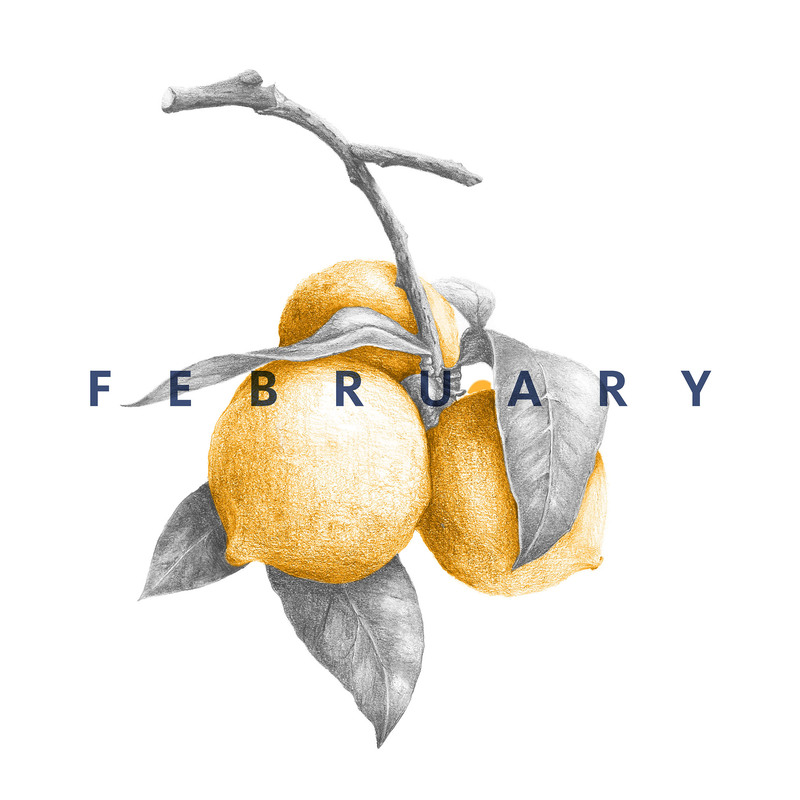 thank you for the lovely post – i enjoyed both the story and the recipe. what a wonderful experience you must of had. i’m guessing you found it to be enlightening on a variety of levels (credit cradle at dress head store). I would love to try the recipe but unfortunately do not have a food processer. could i make it suscessfully with purchased almond flour? if so, do you know what the equivalent in flour would be that amount of almonds? thanks for any thoughts you might have. It should be about 2 and 1/4 cups of almond flour, though I haven’t tried it that way yet. Please comment back if you try it using almond flour! I’d love to hear how it turned out. I made this for Easter brunch, and it was SO GOOD! I used 1 3/4 cups almond flour, I didn’t really think about what amount 1 3/4 cups almonds would turn into. It worked out though! I also added a dash of vanilla, and a couple tablespoons of grapefruit juice. It was a huge hit at my family brunch. My step dad told me it was the best thing I’ve ever made, so thank you! Such a pretty way to dress up a delicious cake. I’m looking forward to seeing you soon! This is amazing! I cannot even believe what a rich, full life you’ve already lived. I love it and have so much to learn from you. Let me know how yours turns out. There are a few recipes out there with less eggs and added ingredients! ThankYou so much for this recipe!!! I just love love love this cake – it”s sooooo moist and delicious!!!! I have one question – what do You think if it would be ok to replace sugar with honey?! There is lot of sugar in the recipe, and I was thinking about the ways to make this delicious cake even more healthier?! Thank You!!! I’m not sure about it because the consistency of the cake might change. If you try it, I would try just part honey. Please do let me know how it turns out!! Thanks so much for the recipe – I’m in Santiago de Compostela now & have had 2 days – wish I was able to walk The Way but have enjoyed meeting pilgrims & hearing their stories. I can’t wait to make the cake! Oh I’m soo jealous that you’re right there!! It makes the cake even better, enjoying it in it’s original origin. Enjoy! I’ve just returned from our Camino; we started in Sarria and walked the last section also, enjoying Tarta de Santiago along the way. Thanks for the recipe! I’m so jealous that you just went on the Camino. I hope to do it again one day. Cake and looks awesome with the cross on top. Health food stores) for all my baking instead of sugar. It is a powder and you use 1:1 so easy substitute. With erythritol you end up with a gluten and sugar free gorgeous cake. WOW! I will have to try erythritol, sounds intriguing for those looking to lower sugar intake. And I’m sure the cake still tastes fabulous with all the nutty almond flavor. Dear Becky, What a lovely cake! It would be respectful if you would attribute this recipe to its author, which you have duplicated exactly from James Beard award winner Claudia Roden, which she first shared in 1968 and then adapted to a simpler version. Although the cake’s history goes back to the middle ages, it was a cake served during Passover in medieval Spain, when the many Jews who lived there could not eat flour during Passover. The history of this cake can be found in a wonderful BBC interview with Claudia Roden available on the internet. Thank you for sharing and also for attributing it. Lisa, thanks so much for your comment. I added that attribution, thanks for letting me know that it was forgotten. That is something I always try and have on my recipes that are not my own but occasionally I do forget! I loved this cake!! We finished our Camino on June 22 of this year. I first tasted the cake in a small albergue in Fonfria. I think I ate it at least once a day from then until leaving Spain. I immediately looked for a recipe when we got back to Canada and I’m planning to make it tonight. Yummmmmm. Donna, how long were you on the trek? I’m glad to hear from another sojourner! 2 1/4 cups almond meal is way too much. The egg yolk & almond flour mixture came out the consistency of natural peanut butter. Christine, this mixture is very very thick as I said in the instructions but I promise that it does bake out into the right consistency! Becky, we were 35 days from St Jean Pied de Port to Santiago, including one rest day in Burgos. We took the bus to Finisterre but I think it would be a good stretch to walk, and then on to Muxia. I miss it. And the cake. And the wine. Wow!! 35 days, that’s incredible! I’m sure it was a fabulous adventure. I hope you had many beautiful spiritual moments! Nice post. I would like to walk the Camino myself one day–and yeah, I have sought the ‘perfect torta de Santiago’ myself and found a couple–one of which is gluten-free for those so disposed. I more typically make one with a 1/3 cup of flour which, on reflection, might not be necessary. We have just returned from wslking the last 115k. A fantastic experience! I just thought I would have a look for the recipe and found your site. We are having a little reunion for the 12 of us who walked, so now i can made the tart for the evening. Thank you! Congratulations!! I hope the walk was spiritually enlightening for you and that now you can rest in God’s arms. This cake always makes me relive those sweet memories. Enjoy! Przeglądam Twojego bloga i jestem pod kompletnym wrażeniem nie tylko zapisków, czy receptur ale także wspaniałej osobowości. My husband and I celebrated our first wedding anniversary today and we decided to spend the night in. After deciding on paella I set out to find a spanish influenced dessert and stumbled across this recipe. I am so glad that I did. The nutty, citrus flavor is amazing and while satisfying the sweet tooth it is not over indulgent. I took a queue from the picture and served with homemade whipped cream. This is going to be a staple in my dessert arsenal- thank you for sharing! Wonderful Katie!! Thanks so much for reporting back. I’m so glad you enjoyed it too! Thanks for doing the research and finding this recipe. Hopefully, sometime in the future, I will be able to visit Northern Spain and enjoy it there too. Just pinned! hello, i was wondering if you use any flour in the recipe? is the cake batter consisted of all the ingrediants without flour? thanks! Patricia, it’s technically a gluten free cake! No flour in this one. Enjoy! Two of my good friends and I finished the Camino in July/August 2012 from St. Jean to Finesterre (we walked 34 days) We still get together and talk for hours about our experience! Really excited to try this recipe- I’ve had a hankerin’ for some. I think I had at it at least once a day after I tried it for the first time! Gina, I felt the exact same way when we returned and it took me years to track down the right recipe!! Now we’ll have it every year. Hope you enjoy it too! Sorry, but I suspect that butter is missing from the list of ingredients, but present in instructions. Actually there’s no butter in this recipe!! Thank you so much for sharing this recipe. It was very delicious and received rave reviews! I loved the citrus flavor with the almonds. I did blanch my almonds which I’m sure makes a difference in the texture of the cake. I was really surprised at how moist it came out! Next time I’ll grind the almonds a little finer, I was afraid to over process them and end up with almond paste….I just made it and I’m planning on making it again this coming weekend! Thanks so much for reporting back. So glad you liked it. I’ve been wanting this since I returned from my Camino in early November (33 days from SJPdP to Santiago). Ate it every chance I got along The Way. I hope to try this recipe soon. I did the same!! I hope your camino was filled with light and inspiration! Åh thanks for the recipe. Will make it tonight on new year’s eve I think. I walked Saint Jean Pied de Port to Santiago de Compostela during 23 days this autumn and the cake was something I really enjoyed as I’m gluten and lactose intolerant and there wasn’t many desserts for me. The best tarta de Santiago I had during my pilgrimage on the Camino Inglés right after the Francés. In the small albergue in Bruma that got it’s food from a bar a couple of kilometer away. It was perfect. Now we have eaten it as well. So good, thanks. YAY!! Glad it was enjoyed! Hi, how many servings does this yield? It will have 8 generous slices! Hi, My husband and I who are both 65 are planning on walking the whole Camino Frances in September 2014. My husband has had major back reconstruction in 2013 and this is his “carrot”. He will probably walk/bus/taxi some of it but I am going to try to walk the whole way. ANYWAY, two friends of mine who know I am in training gave me a bottle of Spanish Rojo for my birthday a month ago so I am planning a dinner with them enjoying the wine. I was looking for a Spanish Almond Tart for desert and here it is. Gracias. This looks so lovely. I want to make it now! I have almond meal and no food processor. Dare I try this? I think it should work fine with almond meal! Please do report back! Ok Becky, Friday night I’m making it. Will report back. if i halved the mixture (to make a smaller cake) would it still work do you think? That should work fine, just bake it in a smaller pan and cook for less time. I’m taking a course for people who want to volunteer as hospitaleros. I will be staying at someone’s home as the course is in Victoria and I live in Vancouver. I was musing aloud to my daughter about something to bring as a thank you and she suggested I make this cake. What an excellent idea! I’m sure everyone will be thrilled. Hi. I was looking for an almond cake recipe when I stumbled on your website. Thanks for the perfect recipe, and I will enjoy exploring your blog! wonderful!! 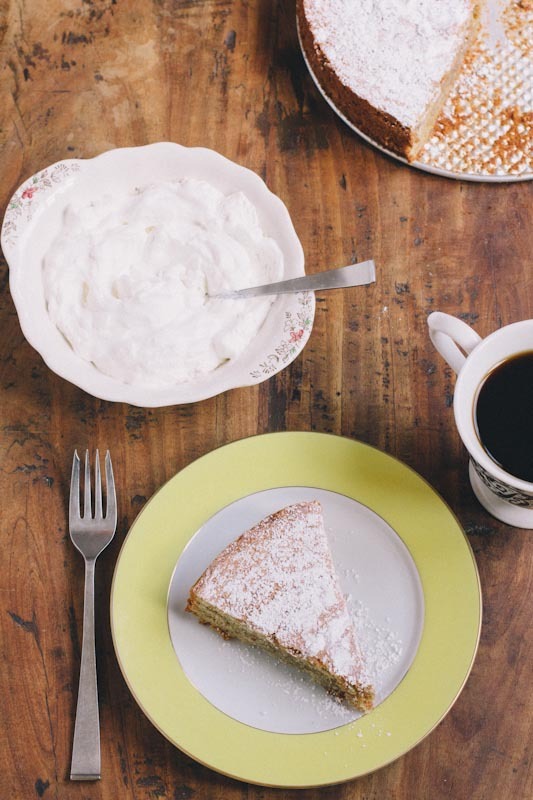 The almond cake is a favorite of ours. enjoy!! This is a fabulous cake- thank you from Hawaii. I baked this for Easter. For those of you wanting to reduce sugar: I used 3/4 cup Coconut Sugar which a super food & has one of the lowest glycemic counts of any natural sweetener. It also has magnesium, potassium & B vitamins. Look for NAVITAS brand. It’s a fine dark brown sugar which produced a lovely golden cake. The cut-out cross was a lovely and zi can’t then you enough Becky! Beautiful images & recipe Instructions! Aloha from Maui! I’ve been wanting to use more coconut sugar!! Thank you so much for the tip! I’m so glad you enjoyed the cake. Sorry to hear about the blender. Ironically, mine is currently at the shop right now 🙂 Glad you enjoyed the cake! Is is possible to make this the day before and add the confectioner’s sugar just before serving? I have a big meal with paella to make and wanted to see how long this could be done in advance. Thanks for this great recipe! I think this would be fine if made the day before or even two days out. Refrigerate until you’re ready to serve it. Sounds like a fabulous meal you have planned… enjoy! I just came back from Santiago Compostella and my husband and I were bemoaning the last bit of cake that I brought back with me. They had told me in the shop, not to refrigerate and that it would hold. Their expiry was about 10 days and it did last. Thanx for the recipe, can’t wait to try it. Liz, when you try the recipe, please report back! Buen Camino! The meal went great, and to make the cross image really sharp and beautiful, I put 3 straight pins along the vertical part of the cross and then dusted the cake with powdered sugar. With the help of one more hand, we were able to pull the cross off without disturbing the image and keeping it sharp and clean. It was beautiful in the end and soooo tasty. I also had trouble finding an 11 inch spring form pan, so I used a ten inch pan, and at 40 minutes, I turned the oven off and went 5 more minutes and it was cooked perfectly in the 10 inch pan. Thank you! Sounds perfect Steven!! Glad it turned out for you!! Used 1/2 the sugar as I routinely do and it was still too sweet to my taste.
! Will cut it further – perhaps try using just a bit of honey. Sugar, it turns out is terrible stuff for the body-the research is in -so I keep trying to lower. I’m glad to hear the cake still works with less sugar. I’ll have to cut the sugar next time too! I have just come home after completing the Camino and had my family around so really wanted to make this. It was just like I had and everyone enjoyed the cake along with the stories and photos. That sounds just perfect Daryl!! So glad you could share a slice of the Camino with your family! I hope your journey was enlightening and encouraging! A Camino is not possible without Tarta de Santiago! Just returned from walking thr last 200 km with my three sons, ages 17 to 23. A wonderful experience, many memories and we had plenty of Tarta de Santiago! Will definitely try the recipe when we arrange a reunion with friends who have also done the Camino. Beun Camino! Beun Camino Peter!! Glad you had a good time.. and what an adventure for your sons. I’m sure they will never be the same after that experience that you gave them! On Aug. 24th, we finished the coastal camino from Irun. Total of about 300 miles walking (we skipped the large urban areas). Had tarta whenever we could. I’m glad I found your recipe. I just pulled it out of the oven. Santiago cross stencil is ready. Can’t wait to eat it tonight. That’s beautiful to hear Lugo! Hope it was enjoyed! Jane, I just had a friend do the Camino and she told me all about Finesterre!! I would love to go back for a longer time! What an incredible experience you must have had?! I make sangria and paella all the time but for some reason I don’t have either of them on my site! Now, you’ve motivated me!! I do have a white sangria on here though. I’d love to try this almond cake. Ive only made one with an orange syrup sauce poured over the cake. I was wondering if I could use say 3lemons with coconut sugar or do you think it will be too sour? Having friends over for dinner tomorrow and being on the Paleo diet, this is PERFECT! please could you reply today, if possible, as Id like to make it today. I have been searching for this recipe for ages. Had it in Menorca at a lovely restaurant in Fornells overlooking the sea. I have since lost my husband but intend to try this wonderful recipe for Christmas with my girls and their partners and my father and mother in law who are now in their 90s and still active. Thank you for sharing this recipe. Lindy, that just blesses me to hear that you will be making this for your whole family!! thanks for sharing and happy holidays to you! This cake is in my oven now. I am bringing it to a pre-Camino party tomorrow night. It smells delicious. I enjoyed it so much last year when I walked from Leon to Santiago. On September 4 a group of 5 of us (some friends and some soon to be friends) are walking from Ponferrada to Santiago. God willing the whole Camino in 2018! Blessings to you on your Camino Diane! This is my husband’s favorite cake. I’ve always ground the almonds in the past, but I’d like to use almond flour for convenience. How many cups of almond flour would you suggest to use? Measure the almond flour by weight so it equals the 1/2 lb of almonds that the recipe calls for. That should do the trick 🙂 Enjoy!! It’s a favorite of my husband too! My wife and I just returned this weekend from a long visit to Spain, the first part of which was walking the Camino from Leon to Santiago. I am a foodie, and I especially like dessert. Like you said, this cake is a traditional offering in just about every eating establishment in Galicia. I was looking for the recipe online when I came across your posting. Thank you for providing this recipe. I can’t wait to make it. 🙂 Buen Camino! Ken, so wonderful to hear that you had a good camino! And I hope you enjoy the cake!! This recipe is perfect! I’m so pleased to find such a delicious and authentic Tarta de Santiago recipe.. I did the camino in 2014 and thoroughly enjoyed this desert almost daily in Spain. It brings back such good memories (especially when paired with sangria). Thank you! It really is a lovely cake. It was a bit of a surprise to see that you’ve taken the cross stencil I spent time creating for my own recipe and website. Feel free to ask and credit the owner, should there be a next time. Hi there. I’ve actually never visited your blog. I found the pdf years ago (2011) in a google search. I’m sorry if I accidentally used yours I guess I figured it was just the symbol of the camino up on the web. I added a link to your website. Becky, this cake is just wonderful! It reminds me of the time I spent in Spain living with my friends family for several months! The stencil you are sharing, however, is from another blogger named John at He Needs Food (I checked the file name and everything). He actually created this stencil by hand and although I am sure it is a common look, I’m also sure he’d love credit back!! Thanks April. I’ve actually never visited that blog. I found the pdf years ago (2011) in a google search. Sorry for any confusion. I was lucky enough to do the whole Camino in 2014, and traveling with my GF sister, this tarta was one of the culinary highlights. I’m so glad to have found your recipe and use it every time I bake one. A little slice of Spain! Thank you! Its definitely one of those natural gluten free glories!! What a beautiful thing to get to walk the camino with your sister! I finally made this cake. I used an 8 inch pan and had two small loaf pans as well. It is tasty but in my case I think I would reduce the amount of orange and lemon zest, as it overpowered the almond. The size of oranges and lemons vary, so it could just be I had huge fruit. I like the texture of the cake a lot. I made this cake and loved it, and perfect and easy recipe. I am just wandering if I can make it a day or so in advance? Totally, it will keep for a few days or you can freeze it. I wanna try the recipe and wonder about monk fruit sweetener in place of sugar, Hoping to return to Camino this summer as years ago I only did the final stages. I honestly am not sure about monk fruit sweetener as I’ve never used it! Please do report back if you decide to use it as a substitute. This is a Jewish kosher le Pesach (passover) cake. Wonderful to know Frank! Sometimes I don’t always know what all diets or holidays that my recipes fit into but now I’ll have to make this one during the Easter months! I’ve been meaning to write for a while. As I have a wheat intolerance this reciepe was a godsend to find two years ago and I’ve made it for many an occasion with good results.I halve the amount of sugar as I think the flavour is much better and sometimes I make it with ground walnuts instead, which is very yummy too! When I found it I had just come back from my Camino through France from le Puy en Valay to St Jean Pied du Port so it was a nice connection to make. Thanks for putting this up and do try with half the sugar, you’ll enjoy it doubly!! Naoise, I’m so grateful for your comment! I will definitely be trying it with half the sugar soon. It’s so good to know when recipes can work well with less sugar. And buen Camino to you!! If you’re ever in Salt Lake City, our little coffee shop La Barba serves up this cake in individual sizes and it’s such a fun treat with coffee! Thanks for catching that David! I just return from walk from st Jean to Fisterra. Enjoy the cake on the road. The recipe very good I have add some extra ingredients Dash of grapefruit juice dash of Frangeligo liqueur And used little less sugar. Thanks for the fun ideas for alterations Ellen! Excellent cake. 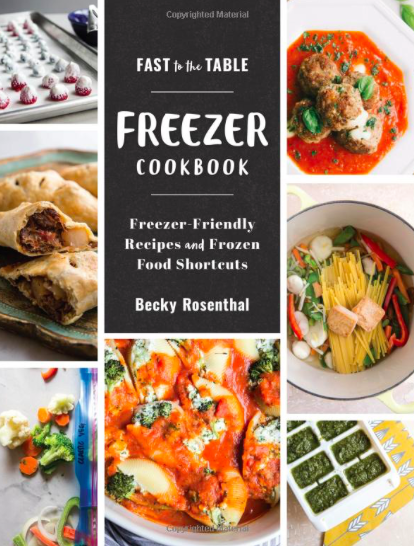 Do you know if it freezes well? I made this recipe last night for the first time and it was amazing! It was very rich in flavours. I would probably reduce the baking time to 30 minutes because mine came out a little bit dry, but it could have been my oven. Will share the recipe with the friends I did Camino de Santiago last week. Thank you! Thanks so much for reporting back! Hope you had a wonderful journey! 1 1/2 cups of almond flour is a little less than 150 grams. Hope that helps. LOVE that this cake is a part of your Thanksgiving traditions now!! I may have to add it to mine too! My name is Becky and I have a confession to make. I romanticize my grandmother’s era. I currently live downtown raising my two kids. My husband runs La Barba Coffee and Creek Tea. Want to learn more?